Mazda reveals the first video of the all-new 2014 Mazda3 when it was unveiled behind the scenes in New York and four other locations around the globe. The 2014 Mazda3 was revealed with a splash last week but not just in one location like most automakers when they introduce a new car. The all-new Mazda3 was unveiled in five different locations around the globe on the same day. Mazda has big global plans for the completely redesigned and re-imagined third-generation model. Mazda has released the first video of the New York reveal and the first ad of the all-new four-door compact in Japan. Both videos are included below. It all started on Wednesday when the new Mazda3 was revealed in five different locations around the globe on the very same day. The global debut kicked off in Melbourne, Australia under the theme, “conviction creativity and courage,” where a live CAD demonstration highlighted the cars styling. Next the newly redesigned compact was revealed in St. Petersburg, Russia where French product and interior designer Kito Morivito talked about the interior of the Mazda3. It moved on to Europe where the car was introduced in London, England where the cars SkyActive technology was highlighted featuring the small sedans performance and high mileage. Next up was Istanbul, Turkey where a special technology reveal with Aha conductivity and infotainment featuring the cars technology. Finally the car was revealed in New York to the U.S. auto press where expectations were high and we caught first sight of the new Mazda3. Mazda says the new car is “more luxurious, more efficient and more intuitive.” It certainly looks like Mazda has hit its mark. Mazda has designed three basic design elements of KODO in to the newly redesigned and re-imagined compact car. Derek Jenkins, Director of Design North America explained the three elements at the New York reveal this last week. The Mazda3 has been around for ten years and the third-generation 2014 Mazda3 kicked off its global birthday party with a huge splash around the globe. Mazda hopes it will propel the new model to global success as it attempts to be the leader in its segment. 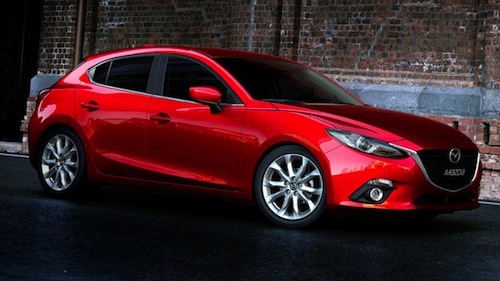 Look for the all-new 2014 Mazda3 to be in U.S. showrooms this fall. Pricing will be announced closer to its North American launch. Watch The global reveal of the all-new Mazda3 and first ad videos.